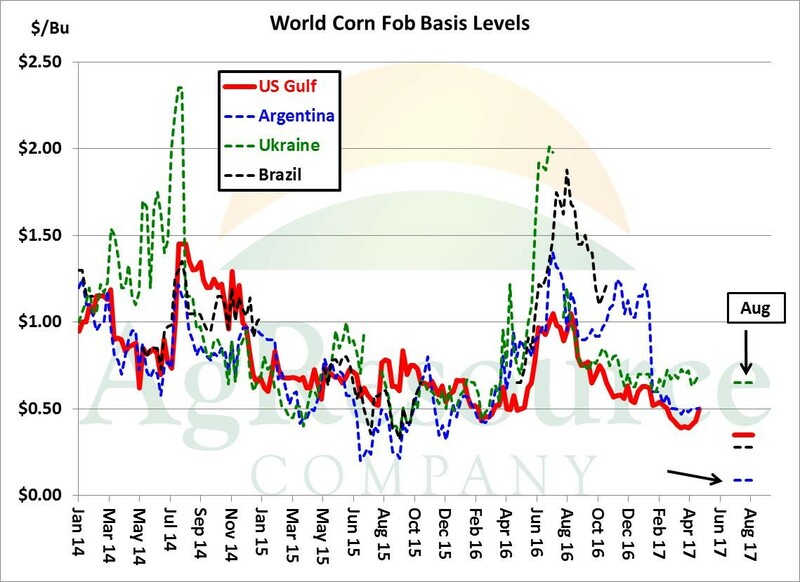 South American Corn Prices Very Weak – but Nearing a Bottom? South America still looks to take over world export demand beginning in early summer. There’s been no threats to Argentine harvest progress, and there are hints that one final finishing rain event will impact Brazil in 8-15 day period, which if realized validates record Brazilian production estimates of 92-94 MMTs. Notice above that Argentine premiums rest at just $.09/Bu over CBOT futures for August delivery, which compares to Gulf premiums of $.37-.40 for mid- to late summer. Simply put, it’ll be tough to compete with South America beyond the next 30 days or so. And weakness in South American corn prices is logical, and rather seasonal, and out work suggests a bottom is near. 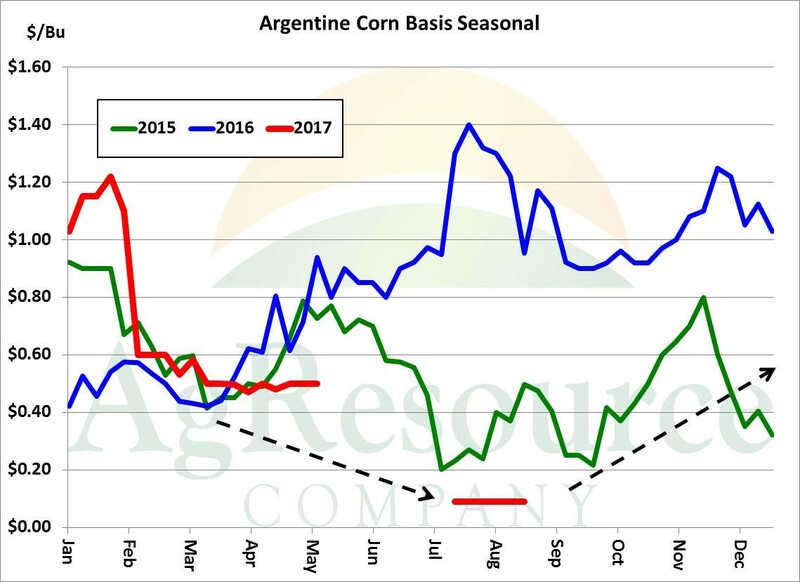 The seasonal trend in Argentine corn basis is displayed above, and just beyond harvest cash prices tend to strengthen. As world demands finds Argentina, prices should be much more supported, and with Gulf basis near record low, it’s possible that the US market maintains a solid portion of its world market share in 17/18 – though a boost in US export demand isn’t likely until Sep/Oct. 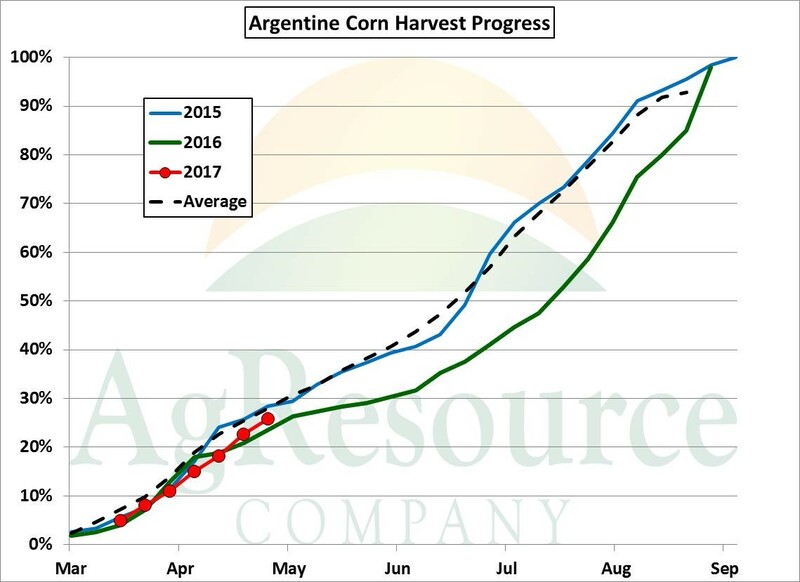 Corn harvest progress in Argentina, which reached 26% complete last week, is right in line with longer term averages. Producers in Argentina will switch to soybeans in the next 3-5 weeks, and once Argentina’s corn crop is 60-70% harvested in late Jun/early Jul, we look for the world cash grain market to be much more supported. So, the strategy is still to await strong rallies to advance sales and better opportunities lie ahead in the next two months, if briefly. Also, the USDA’s May WASDE report, which is the first that includes new crop supply and demand, will be released Wednesday. Sign up for an absolutely free trial of AgResource’s newsletter, which will include a complete analysis of the May WASDE report, at https://agresource.com/research-matters/.